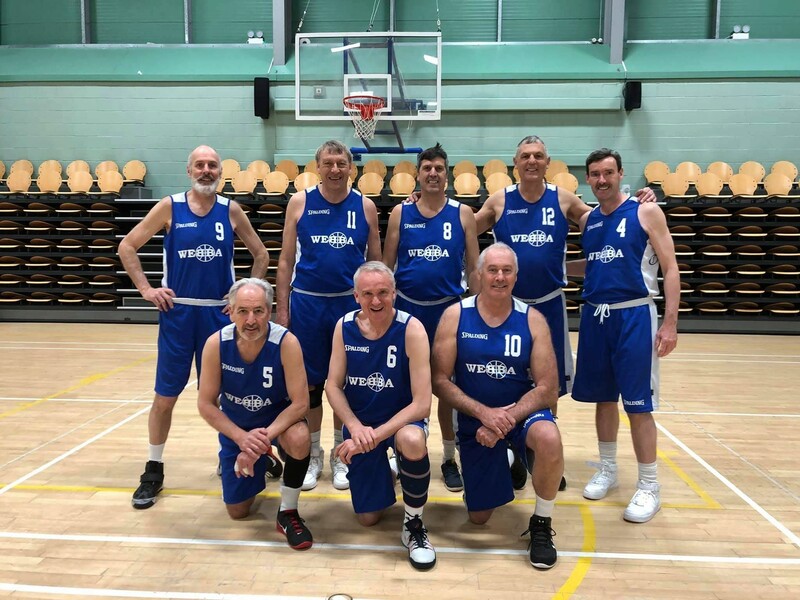 WEBBA men have played at every GB Masters since then, but only started appearing in other International Masters events when Pete Radford was invited to play for Strathclyde’s 60+ team in the 3rd Strathclyde Masters at Easter 2016. He played for them again when they won the Galway 60+ trophy in 2017 and again when they came 2nd to Galway/Harlem in 2018. Galway 2018 was also the first time that a WEBBA 40+ Men’s team played in this great Irish event, as reported in Webba news by player-coach Densil Williamson after the tournament. WEBBA first entered a 50+ Men’s team with this small but effective squad at Dundee in 2013. Rich Wills, number 4, had badly sprained his ankle the week before travelling (note the strapping), so only stepped on court for the tip-off to say he’d played. He then coached the team admirably the rest of the weekend, doing a grand job of keeping all five players happy with their court time. The story of the weekend, though, was when Rich phoned around to try to get a 6th player. Mark Warren was in the south of France house-sitting, or dog-sitting, or both, and dropped everything, got on his motorbike and rode from The Pyrenees to Dundee in time for their Sunday morning tip-off. Think of that whenever you hear someone say of a person, ‘they’ll go the extra mile’. The team photo was taken on the Saturday, while he was burning rubber on a French motorway, but he’s in the next one. Last weekend, finally, Pete was able to get together the area’s first ever 60+ team to contest an international masters event. 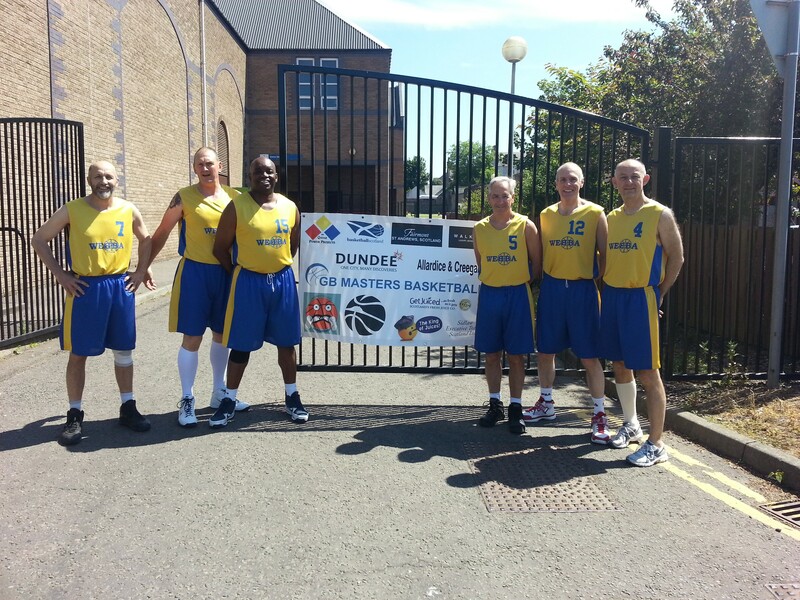 Strathclyde hosted seven women’s 45+ teams, eight 50+ men’s teams and four 60+ men’s teams from the UK and Europe. 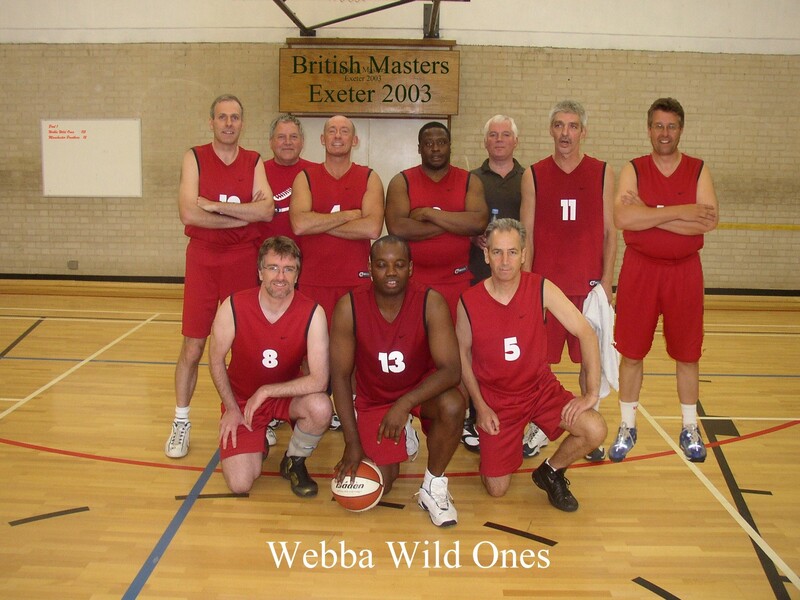 Five players with very long associations with WEBBA made the trip; Paul Ambrosius (who first played WEBBA 40+ in Aberdeen 2004), Ken Nottage (who lit up WEBBA courts for Stroud in the early 2000s, after a distinguished, 19-year national league career for five different clubs, and England honours at every junior level, finishing with 58 appearances for the senior men), Pete Radford (WEBBA from 1976 with KBI and Lockleaze to the present day – with an 8-year sabbatical with Pirates), Gordon Shovlin (Webba with Lockleaze since 86 to the present day) and Mark Warren (Empees) of the epic motorbike ride. They were joined by Ray Kirk from Exeter, Steve Murray from Oxford, Richard Herbert from Hertfordshire (England U16 Schoolboys), and the Welsh Police and British Police basketball legend that is Clive Jones from Bridgend (alongside the very long and distinguished police teams career, Clive also represented Wales at U15, U19 and Senior Men for 13 years from 78-91). To reflect the slightly wider-than-Webba make-up of the team, they called themselves Severnside, being a side from both shores (and slightly inland) of our region’s great river, estuary and sea. But they wore WEBBA’s colours with pride. Note that Gordon and Pete were pioneers for WEBBA at all three Masters age levels. If you’re wondering why Paul Ambrosius isn’t in the picture, he orignally told former Derby area teammates that he would play for them, but switched his allegiance to Severnside once he knew there was a team from his home area. When they turned up with only six players (including his 74 years old former juniors coach; still playing extremely well!) to play Severnside in their first game on Saturday, Paul felt duty-bound to honour his first commitment, so it was agreed that he would play for them. That first game was tough, but Severnside gelled from the first minute and withstood everything Derby threw at them, including lots of elbows, to win by ten points. In game two on Saturday afternoon they met the hosts, Strathclyde, who had never lost their own 60+ tournament. The Severnside chemistry was even better than in the first game and they beat the hosts by 16 points, with every player contributing in all departments. Strathclyde tournament dinners are noted for their hospitality and entertainment, so the Severnside boys played another blinder to take it easy on the liquids and the dancing, thinking ahead to an early appointment with Shannon at ten o’clock on Sunday morning. Shannon is a very experienced, wily side, containing several former Irish internationals. They have contested 60+ tournaments all over Europe for almost a decade. 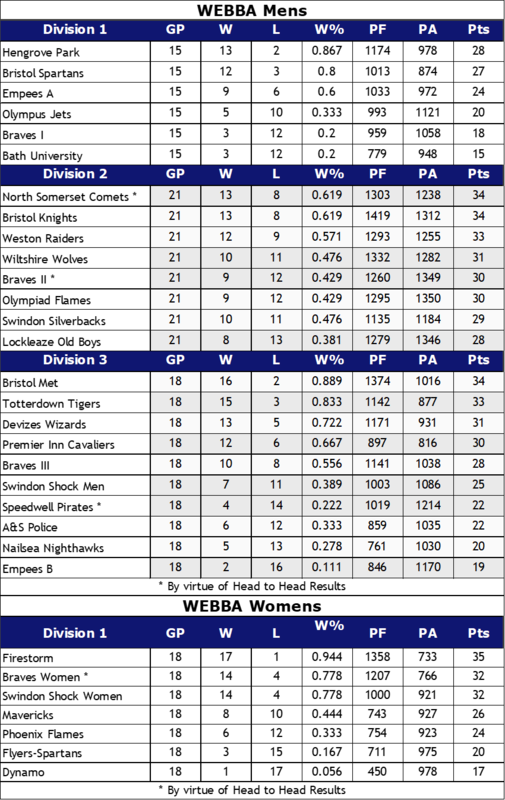 Regardless, our boys continued to play even better than the previous two games to win by eighteen points. Despite having played three, won three, with a +44 points-for difference, the tournament was set-up to provide a final at 3pm for the top two teams. Unfortunately for Severnside, Ken Nottage’s flight home was at 3pm because he had to get back to Cheltenham to coach his home team in a cup semi-final. Having done the right and honourable thing in loaning Paul Ambrosius to Derby at the start of the tournament, they were hoping to have him back to replace Ken when Derby lost their last game to Strathclyde. If Derby had won, Severnside would have played them in the final, but Strathclyde’s win by double figures put them into second place. Understandably, the organisers (both Strathclyde players) insisted that the ‘players can only play for one team in an age group’ rule had to apply. Even with just seven players, and without Ken’s dependable ball-handling, distribution and points-scoring, the game was neck and neck until the last two minutes. Severnside lost the first quarter by three points, but won the second by one and the third by another three, to start the fourth quarter up by a single point. The game slipped away when, through epic defensive efforts, two Severnsiders fouled out and another pulled his groin and they were left with only four on court. Strathclyde’s defence was just as heroic, but they had seven players on their bench to replace the fouled-out and wounded. Five Strathclyders were able find the gaps to score the winning points against just four remaining Severnsiders, to avoid the embarrassment of having their trophy stolen away by the newbie team from the south west. Nevertheless, played four, won three, lost one (with the best for and against difference of all four teams) in their first ever 60+ tournament was a great effort. Well done to all involved. The team was hoping to be able to contest the Dublin International in May and the GB in Manchester in June, but other commitments mean that they will have to wait until the Galway International in November to get together again and give all the other teams another fright. Team Secretaries will have received emails with any discounts they are entitled to in relation to referee support and prize money.